The Emory-Georgia Tech Library Service Center will house a shared collection of materials available to students, faculty and staff of both institutions. Photo courtesy of KSS. Emory University and the Georgia Institute of Technology will break ground soon on a new joint Library Service Center (LSC). The LSC is a collaborative project that will house a shared collection of materials, provide delivery services and free up space on the main campuses at both universities. The majority of collections currently in the Georgia Tech Library will move to the LSC, providing space for the Library Renewal Project, a multi-year plan to reimagine Tech’s library spaces and services for the 21st century. 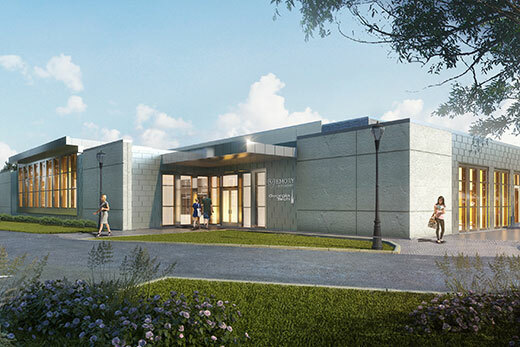 For Emory, the LSC will provide a single off-site location for consolidating materials already housed at other locations, and free up much needed space from its main campus library. Site preparation for the LSC, located at Emory's Briarcliff Road property, is underway, with building construction starting this fall and completion expected in fall 2015. The LSC will house high-density shelving designed to ensure the long-term preservation of and access to library collections. "The LSC is another great example of the expanding partnership between Emory and Georgia Tech,” says Rich Mendola, enterprise chief information officer and senior vice provost for library services and digital scholarship at Emory. "By working together, both institutions will have access to a broader range of library materials, stored in optimal physical conditions and at a lower unit cost." "We are very excited about the opportunities afforded through this partnership with Georgia Tech," says Yolanda Cooper, university librarian at Emory. "Together our complementary resources create an exceptional shared collection to benefit both campus communities. The center will enhance our ability to provide active spaces to accommodate the changing needs of our users, enabling the development of unique services, resources and tools relevant to new developments in research, teaching and learning." The ultimate goal of the LSC partnership is to create a seamless collection with all Emory and Georgia Tech resources (eventually including electronic resources, where possible) available to students, faculty and staff in both institutions, according to Catherine Murray-Rust, vice provost for learning excellence and dean of libraries at Georgia Tech. The intent is to collaboratively manage a single collection while providing the best possible service and access to materials with a focus on user needs, she says. "By relocating the collection to the LSC, we're able to maximize the utilization of campus space and transform the Georgia Tech Library into an inspiring place for people to create their best scholarly work," says Murray-Rust. A secure, climate-controlled facility with state-of-the-art equipment and technology to house library collections, provide access to them, and ensure long-term preservation. A first module to house approximately 4 million volume equivalents, on a site that can accommodate additional modules as needed. A reading room, allowing users to consult materials on site, so that they can make more precise selections of materials to be delivered to a campus library for use. Multiple deliveries per day of print materials to campus locations, and electronic delivery of scanned content, such as journal articles and conference papers.